I'll admit that I was a bit skeptical about golf dice games. I thought there would either be too much "golf" or not enough. A game needed a good balance so it can be fun for golfers and non-golfers alike. Luckily, Patrick Shea agreed. He's the PGA Golf Professional who captured the essence of fun from the sport of golf and created a dice game called GOLO Golf. Just like real golf, the way to win is to "go low" with your score. With this golf dice game, I can enjoy the excitement of playing golf without the sunburns, expensive green fees and sore muscles. Equally important, my non golfing friends can play with me and enjoy it too. Like most good dice games, I can play this one anytime, anywhere and with anyone. If Mother Nature calls for a rain delay, I can still get my golf fix. Required Equipment: Nine custom 12-sided dice and a dice cup. Optional Equipment: Scorecards, game face, golf cleats. Length of Game: Can be short or long. It is up to the player. Object of the Game: To get the lowest score possible! How to Play: Printable instructions for how to play GOLO Golf are available. 1. I found it to be an easy dice game to learn. The ground rules, scoring and game variations in the instructions are simple to follow. 2. I like watching the nine colorful 12-sided dice tumble from my cup. I feel a mix of hope and frustration when I watch them roll and stop...sort of like watching my golf shot on the fairway to see how well I hit it. I'm either celebrating a great shot or grinding my teeth as my ball bounces into the woods. 3.Golfers and non-golfers alike enjoy playing. I played with a non-golfer and a golf nut and both enjoyed this game. 4. I like the fact that I can play GOLO Golf with an actual scorecard from my favorite golf course! Download scorecards from popular golf courses for free. 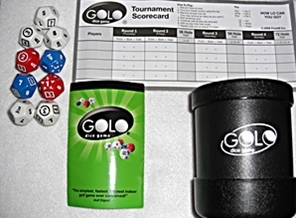 You do need to buy the GOLO Golf dice game. The dice created for the game are custom made and essential for enjoying it. You really can't substitute other dice for this game. This golf dice game can be found online and, from time to time, at retail stores. I bought my travel edition from a local Target store. The GOLO Golf dice game can even be customized with a business logo or name. 1. There are 9 dice which represent 9 holes on a golf course. The average 18 hole golf course is divided into two sets of 9 holes. The 9 holes typically have the same mix of long and short holes, identified by their "par" number. The smaller the par number means the shorter the hole. 2. The dice supplied by the GOLO Golf game represent this mix of 9 long and short holes. The game contains 5 white dice (par 4 holes), 2 blue (Par 5) and 2 red (Par 3). 3. The numbers on each of the 12-sided dice vary by their color. For example: You'll only find a "10" on a blue (Par 5) die. On a golf course, you could find yourself with this unwanted score if you play a par 5 hole badly. That's not as likely to happen on a Par 3 hole, so the highest number you'll see on a red die is "8". 4. The more difficult scores like a hole-in-one, birdie or eagle don't exist on every die. This creates realistic scores similar to an actual golf game. These scores are uniquely identified on each die too. -A square around the number "5" indicates a par score. -A circle around the number "4" equals a birdie (one better than par). -A star around the number "3" equals an eagle (2 better than par). I can play this golf dice game solo or with a group of friends. I can play GOLO Golf with or without a scorecard. If I choose to use a scorecard, then the game changes slightly. I still roll all 9 dice to begin. However, I must remove the lowest scores in the order of the holes on the scorecard. If the first hole on my scorecard is a par 3, then I must choose the score on 1 red (par 3) die first. I decide upon the length of the game: 1 hole, 9 holes, 18 or more!